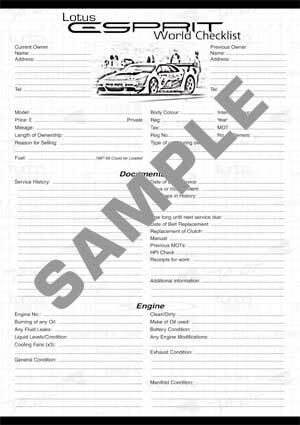 This pdf is to help you when you go to view an Esprit that's for Sale. It's easy to turn up and get hypnotised by it's looks and not actually check the things that are important if you wish to purchase the car. Once you get the pdf file, run it out (using Acrobat Reader, which can be downloaded free  link below) and go over it before viewing the car so you're familiar with it. Fill it in step-by-step as you look over the car using as much detail as possible, this will then give you a better picture of the car after your visit and should help you find things you'd have never spotted otherwise, things like electric mirror not working can cost £150+ each. This can take from 2-6 hrs depending on how careful you wish to be, remember this might be your car, that you'll have to fix, TAKE YOUR TIME. You then have all the information to check the history, contact the previous owner, give the company that serviced it a quick call to see if they can tell you anything about the car, and compare it to other Esprit you've looked at previously. And if your going to make an offer on the car, you'll have the upper hand as you read back your detailed findings to the seller. I still advise getting a Lotus Expert to have a look at any car before you hand the money over, but hopefully with this Checklist, you'll not be calling him too often. Click below to view them online or fill in the form below and I will sent you the checklist as soon as possible. If you do not receive the form within 2 working days, please email me telling me to get my arse in gear. Also any feed back from people who have used the form would be helpful. "Just a quick note to thank you for the check list. After months of looking I am finally collecting my first Lotus Esprit this week. Travelled the length and breadth of the country looking for a good one, finally found the right car 5 miles from where I live, a 1989 turbo with good history and some sensible modifications. I found your web site invaluable and would have probably bought the wrong car at the wrong price without it." We've spend time and effort on this Checklist, and we're sure you'll find it very useful in your evaluation of any Esprit. So we're asking you to pay a small some of money to help with the sites future development. We think £2 isn't too much to ask, considering the amount of money it could save you. We did make the payment optional, but after sending out over 400 checklist, only 5 people donated. So now all Checklist will be password protected. You'll need to pay before getting the password to open the pdf. Email admin@lotusespritworld.com once you have paid and we will email you the password. All payments will be used for the sites development. Remember if you are a ClubLEW member, it's FREE! See the Payments page for ways of paying. If you find anything missing from the list that you think may be of value, please contact LEW and we'll add it on. Also we would love to hear about your experiences of viewing, buying and using this checklist.